I find deadlines have a very focussing effect. It's like my brain switches off the child locks and lets me spot the words that aren't working to their true potential. In the final hours before a deadline I move up a gear and get the sharpest steak knife out of the block — you can use a carving knife to hew the rough edges off a poem, but to release the full flavour it needs the surgeon's scalpel to pare right back. It's always good practice to read a copy or three of a magazine to get a feel for the types of poetry they typically publish. I'm a firm believer that research pays off, so I'll always glance at an editor's social media timelines to see what sort of things they say and share. YouTube is helpful for tracking down interviews with editors where they talk about what they are looking for in a single poem or a collection. Understanding the modus operandi of a publication or competition is no guarantee of success, but I think it stops me sending poems that don't really fit the style. If it's not a themed issue or competition then maybe it's important to consider the language, pace and style of previously successful entries. I try and discipline myself that, no matter that I've edited a poem four times it can always bear a final read-through and punctuation check before hitting the submit button (or licking the envelope if you're a hard copy submitter). The number of times I've read through a poem on the day of submission and spotted a full stop at the end of a line but no capital letter at the start of the next is surprising. Whilst it'd be churlish for a magazine to decline a poem on the strength of one grammatical slip, in a competition like the Bridport that received over 4,000 poetry entries in 2017, it'd be daft to overlook something that might be the difference between making the shortlist or not. Because most submissions I do are Word files, sometimes I might have had a mental slip and spelled something the American way rather than the UK way ... I lived in USA for 5 years and often find it tricky to remember which British words use a z and which use an s! The use of ‘-ize’ spellings is part of the house style at Oxford University Press. It reflects the style adopted in the first edition of the Oxford English Dictionary (which was published in parts from 1884 to 1928) and in the first editions of Hart’s Rules (1904) and the Authors’ and Printers’ Dictionary (1905). These early works chose the ‘-ize’ spellings as their preferred forms for etymological reasons: the -ize ending corresponds to the Greek verb endings -izo and –izein. The situation is slightly complicated by the fact that certain verbs must always be spelled with ‘-ise’ at the end in British English, rather than ‘-ize’: this is generally because they have come into the English language in a different way. [...] The difficulty in remembering which words belong to this group is perhaps one of the reasons that –ise spellings were adopted more widely in British English. My brain seems to engage the turbo boost as a deadline approaches. For issue 68 of Magma on the theme of Margins, I submitted 3 poems but couldn't come in from the cold immediately. I carried on writing and an hour later I'd finished another poem that I thought had a chance, withdrew my previous document and re-submitted with the extra poem tacked on the end. 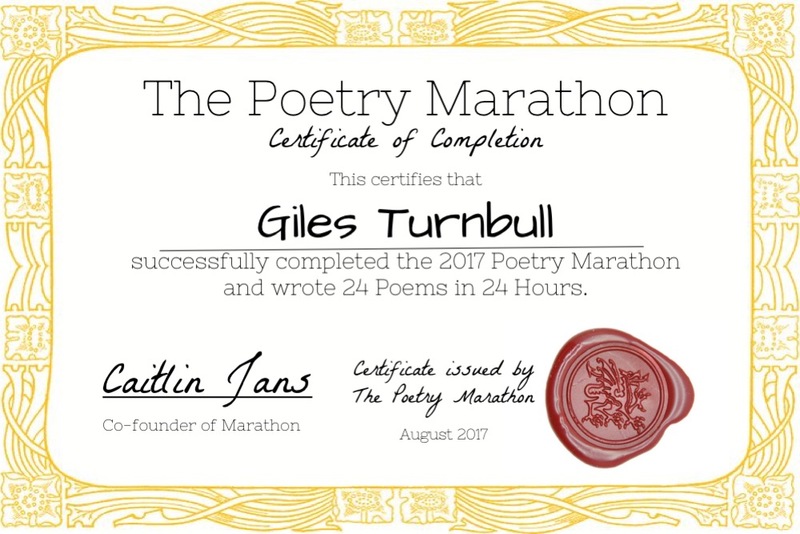 I pushed myself to the limit on this last year, participating in a Poetry Marathon where every hour for 12 or 24 hours half and full marathon poets received a prompt and had to respond to it within the hour. The Goal: Write one poem every hour, for twenty-four hours, straight. My last act of 2017 was to submit to the Magic Oxygen competition which, although it doesn't have any theme, it is an organisation that has the environment at its very heart. I mentioned the competition in my post on 31 December 2017, This is the Way the Year Ends. I remembered about the competition on the very last day of the deadline so didn't have time to write and edit anything new! Thanks for the tips on American/English spellings; I have the same problem having spent 20 years there and now back home for eleven. It can get very confusing!